A special traffic plan will be in operation today (03) due to the rehearsals of the National Day celebrations, stated Police Media Spokesperson. 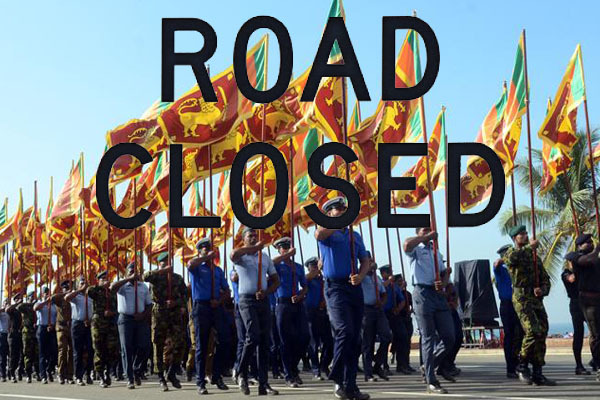 Accordingly, the road from Kollupitiya Junction until the Lotus Roundabout will be closed off for traffic from 6.30 am till 12 noon today. Additionally, the said area will be closed off from 5 am tomorrow (04) as well for National Day celebrations and motorists are requested by the police to use alternative routes. Vehicles entering Colombo from Kollupitiya area can head right from the Kollupitya Junction and vehicles leaving Colombo can travel through Maradana from Olcott Mawatha and Panchikawatte.